Apologies if that reads like an offensive clickbait headline, but this is essentially what Laptops Direct are offering with their current Lenovo desktop PC deal. 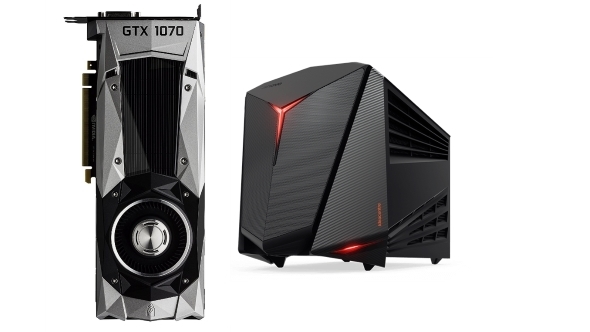 With the ludicrous pricing of graphics cards at the moment, the GTX 1070 makes up a massive 84% of the discounted £747 cost of that PC. Check out our pick of the best gaming monitors around. The little Lenovo IdeaCentre machine is a mini gaming rig sporting a GTX 1070 graphics card on sale for just £830, and with Laptops Direct’s pay-day 10% discount that makes it an impressive £747. Looking around at GTX 1070 cards on their own, they cost at least £630 at places such as Overclockers. That means you’re getting a full PC for a pittance alongside the beefy Nvidia graphics card. The rest of the components make it an okay gaming rig, but for just an extra £117 you can’t really complain. The Core i5 6400 is a decent quad-core CPU that will deliver enough processing power for most games, and you get 8GB of DDR4 memory, a 1TB hard drive, and an official copy of Windows 10. Seriously, the OS alone is worth between £50 and £80. This is probably the cheapest way to bag yourself a GTX 1070 whether you need the rest of the bits or not. You could rip out the GPU, drop it into your current rig, and sell off the rest of the machine for parts. That’s going to make the GTX 1070 great value. But hurry up, the price of this rig has gone up by £50 in the last hour and stock is likely to run dry pretty soon. Get going!